The scenic and historic town of Red Wing, Minnesota is located on the Mississippi River about 50 miles southeast of Minneapolis-Saint Paul. Flanked by the river and steep limestone bluffs, many of the downtown area buildings date from the 1800s. Out of town visitors enjoy the town’s antique shops, fine restaurants, coffee shops and bed-and-breakfast inns. Arts and culture flourish in this small town, which is home to The Sheldon Theater, the Anderson Center for Interdisciplinary Studies and Hobgoblin Music Loft. 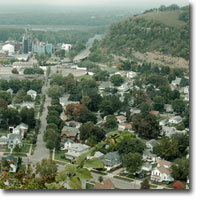 The town is also noted as the home of Red Wing Shoes and Red Wing Pottery. Given its location and topography there are a number of outdoor activities to be enjoyed — hiking, rock climbing, cross country skiing, golfing, bicycling, boating and fishing, to name a few.